Shanghai, China, November 1, 2016 – As the China Arena Football League prepares for its first ever China Bowl, to crown a league champion, it’s a time for reflection. Coaches will tell you it takes execution in all three phases of the game to bring home a title. The Beijing Lions enter the final game undefeated and have the top kicker in the CAFL in Patrick Clarke who has converted 80% of his extra points (32 of 40). he rest of the kickers in the league have struggled. Some say 666 is the sign of the devil. Collectively kickers in the CAFL have had a devil of a time with extra points. The league average is .666 or 112 made in 168 attempts kicking the ball between goal posts that are nine feet wide and 15 feet high. Behind Clarke in CAFL accuracy is Taylor Russolino of the Shanghai Skywalkers. The former New Orleans VooDoo kicker is splitting the up rights at 72.2%. 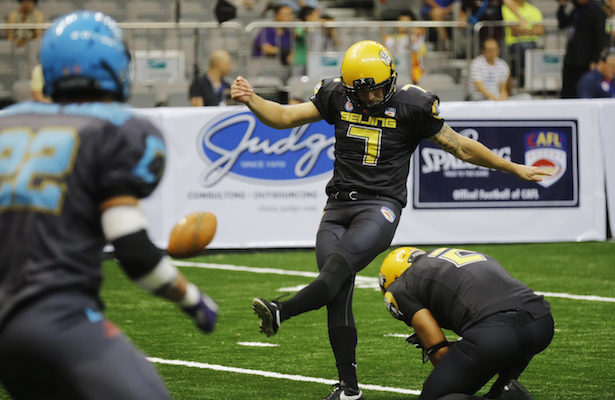 Rounding out the top three is veteran arena kicker Kimo Naehu of the Shenzhen Naja who converts on 64% of his PAT’s. Following those leaders are Alex Carder, 62.9% and teammate Lin Li, 60% from the Guangzhou Power, Chao Ran Li of the Qingdao Clipper, 58.6%, and Dalian kickers Qiu Zixuan (37.5%) and Bing Wang (33.3%). You might think that coaches would opt for more two-point conversion attempts but that is a 50/50 proposition at best as teams have been successful 7 of 14 times. Without question the best of the Chinese kickers is Chao Ran Li. Li hails from Shandong, China and attended Beijing Sports University, helping’ his school to win the National University Soccer Tournament in 2005. In ’06 he played football and kicked for the Amsterdam Admirals in Europe. Then in 2007 he was invited to spend a week with the Oakland Raiders in training camp. In week four of the CAFL season, Li kicked the first field goal in CAFL history. His 21 yarder at the final gun not only gave his team a victory, but it propelled them into the championship game. Li say’s it’s not easy being a kicker in China. Other CAFL kickers have attempted field goals but Li has the only “make” in eight attempts. Other facets of the kicking game have had limited success as two of four onside kicks have been recovered by the kicking team. Li has yet to attempt an onside kick. Li and the Qingdao Clipper will kick off for the CAFL title against Beijing on Sunday afternoon at 3pm in Shanghai.